Sometimes to leap forward into the future, you’ve got to look back and learn from the past. Don’t worry, I’m not about to go all Dalai Lama on you - quite the opposite actually. 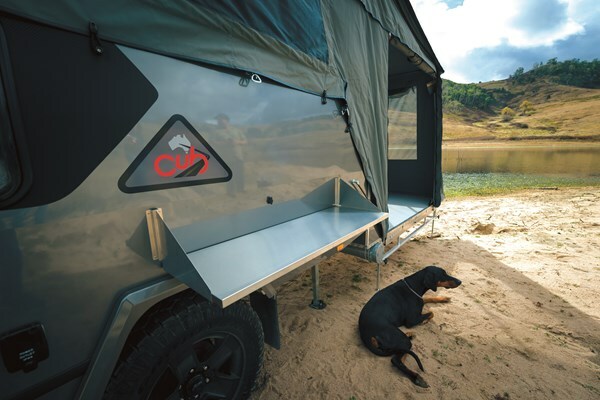 To put it simply, the team at Cub Campers have been building camper trailers for a heck of a long time, and when they take all they’ve learnt in that time and put it into the latest edition of an already impressive camper trailer design, you can bet your last buck it’s going to be nothing short of extraordinary. Over the last few days I managed to convince the boss I was working as I sat by the campfire drinking anything alcoholic, telling bad jokes and skipping a shower two days in a row. Why? Well, I was putting the all new Cub Longreach under the microscope, of course. 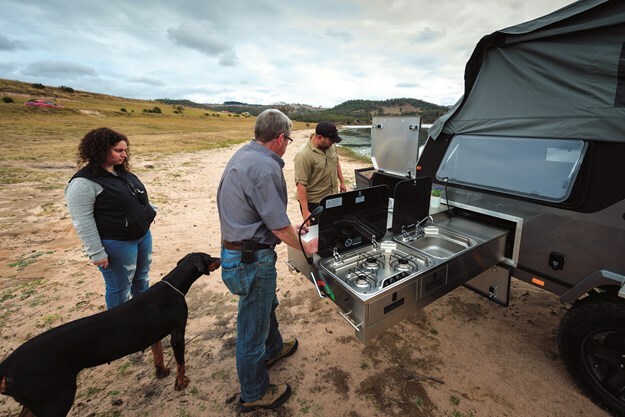 On that note, it’s time to lift the lid on a modern-day veteran of the camper trailer world. Let's check it out. 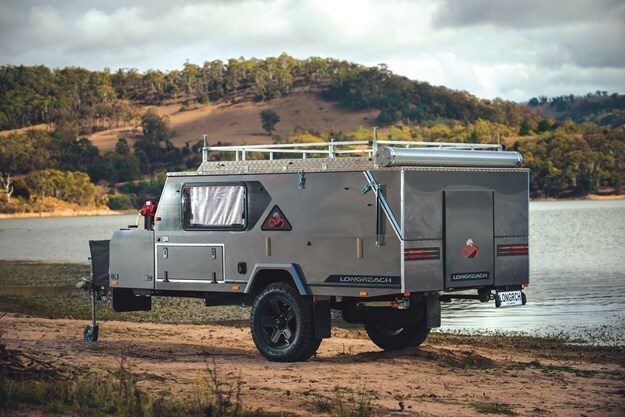 OK, so the first thing you’ll notice is the Longreach is a hard floor camper trailer, only it’s built more like Arnold Schwarzenegger in his prime compared to others of its ilk. Obviously, that extra brawn means you get a heck of a lot more space inside, making it the perfect match for the average family. It’s not too big, though. In fact it weighs in with a Tare of 1204kg, which is not too bad considering the extra room to move inside. It didn’t take long to realise the Longreach is designed and built with the adventurous family in mind. It’s got the comforts of a basic caravan, but doesn’t feel like you’re lugging Sydney's Centrepoint Tower behind you, either. Plus, it’s a heck of a lot more capable off the beaten track. The queen-sized bed measures in at 2100mm long, so there won’t be any ankles hanging over the edge like some camper beds out there. And that large bed frame provides plenty of usable storage underneath, too. For the kids, the spacious internal living area is more than adequate to handle a few extra bunk beds, and being a nice and sturdy aluminum floor means they won’t be leaning to one side or rocking around, either. 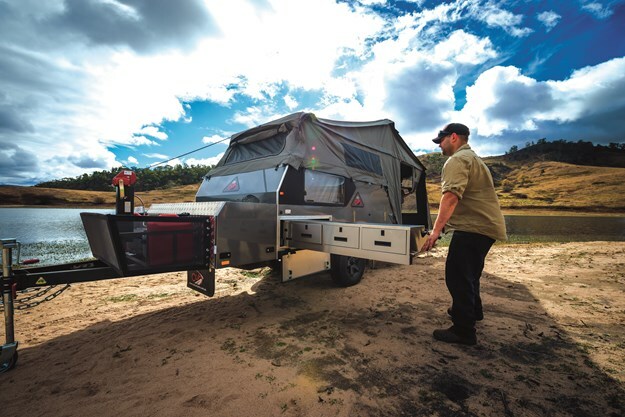 While Cub isn’t known for overly fancy camper trailers, the team have always delivered a good quality product that’s built to last the test of time. They’ve followed the same honest lines with the latest Longreach. I mean, they’ve managed to skip the glitter balls and disco lights and keep things uncomplicated. 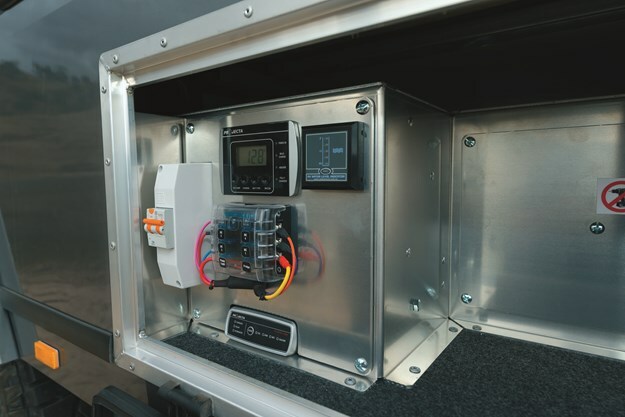 For example, it comes standard with a 100AH battery, which is charged via a Projecta IC2510 battery charger and monitor. 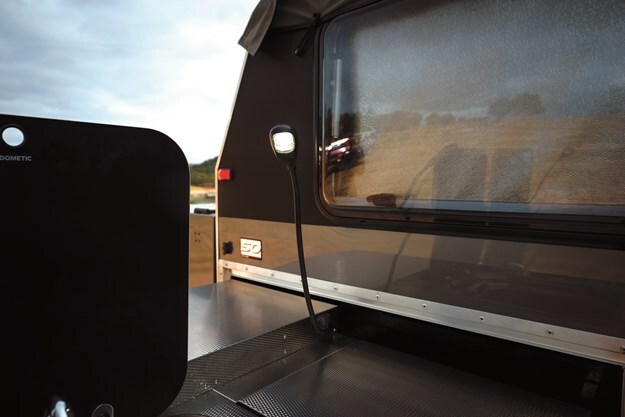 There are multiple 240V, 12V and USB outlets strategically scattered throughout the camper, which all lead to a no-fuss kind of system that just does the job. Talking about plain simplicity - the floor of the Longreach is still the old sheet of plywood. But hey, if it ain’t broke, why fix it? But just to flex a little modern muscle, there’s a silent winch mounted up the front to take the physical strain out of setting up without waking the neighbours. The canvas is made right here in the land of Oz at the CUB factory, and uses Wax Converters' Dynaproof canvas, which is top notch stuff. It includes Midge-proof mesh and sewn-in canvas window flaps. Put simply, the Cub Longreach has a good balance between bells and whistles, reliability and good old fashion practicality. Does it go offroad? You’re damn right it does, but you might want to watch the shiny duco if you’re used to lugging an old rusty box trailer around as it sits a little higher. 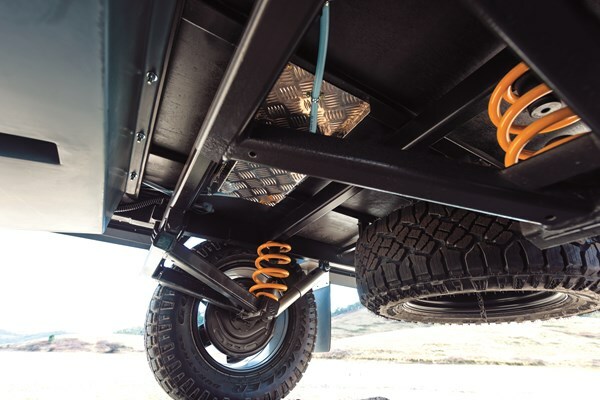 Suspension-wise, it ditches the old solid axle design for an independent coil and trailing arm system, which seems to work rather well both on and off the blacktop. It also sits at a nice ride height, so there’s plenty of ground clearance. Everything underneath is all tucked up nicely too, with nothing hanging down to get snagged along the ground. 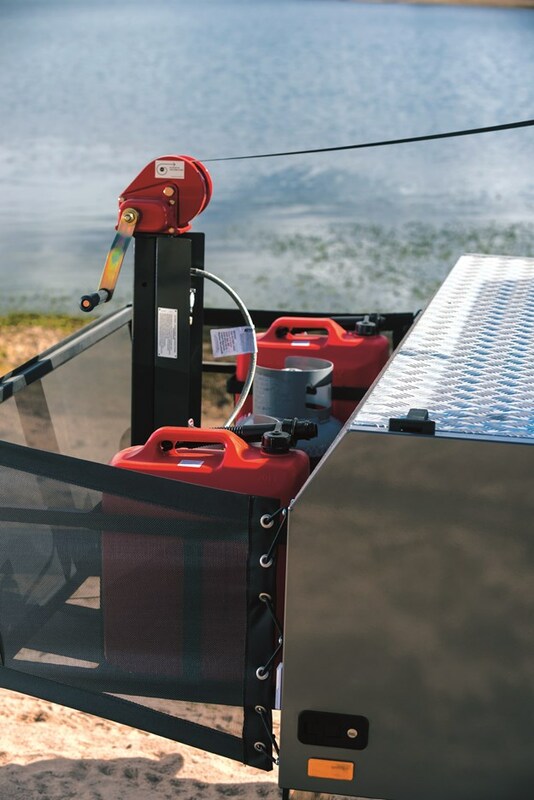 If you do manage to get the camper stuck in a puddle of bother, there are two recovery points at the rear, which are rated to 2400kg. And up the front you’ll find the latest in offroad coupling designs from AL-KO takes care of that 185kg ball weight – the 50mm Off-Road ball coupling. It’s rolling on a flash set of 17” six-stud alloy wheels, which are wrapped with hardy set of Goodyear Duratrac tyres. 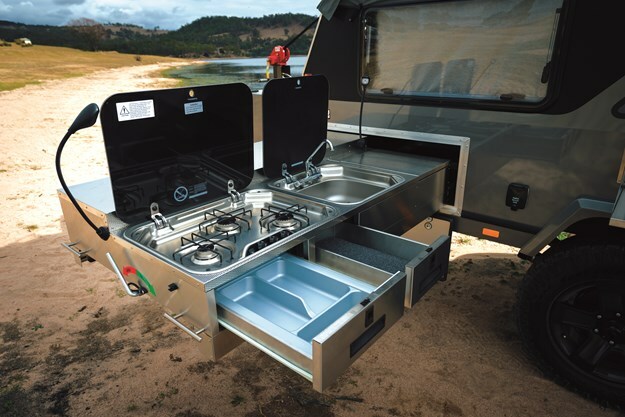 The roll-out deluxe kitchen design on the Longreach is a cracker. It’s a large and spacious stainless steel slide design, with more storage compartments than grandma’s handbag. And there’s enough storage space around to prepare a feed for the Australian army in Baghdad. It’s an extremely practical, easy-to-use kind of unit. The old tried and tested Smev three-burner gas stove and stainless steel sink gets the prime position, and there’s a 100L water plumbed to a 12V water pump too. A handy little feature is the old manual hand- pump style tap mounted up on the front toolbox. 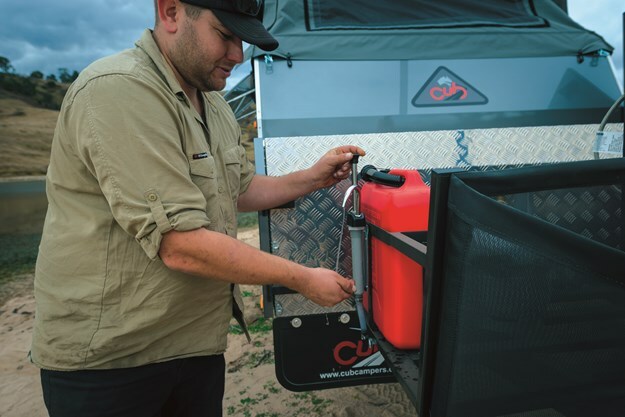 It comes in super handy around camp, or even for roadside stops, and means you can still access the water if the battery dies. I’m going to be straight up and honest here; there are much fancier campers in the camper trailer market if that’s what tickles your fancy. But if you want a good blend of modern innovation and practical thinking, along with a fair dash of tried, tested and proven construction techniques, the Cub Longreach will probably be right up your ally. 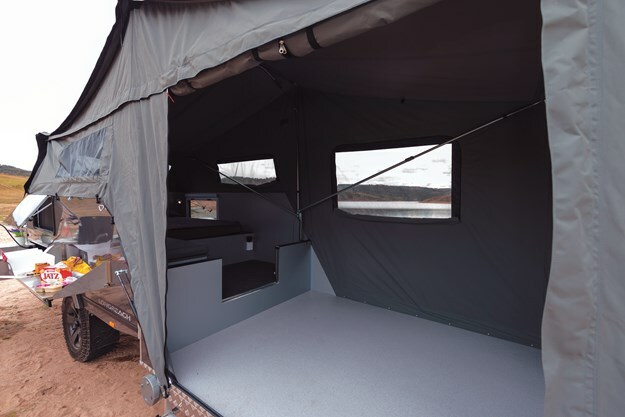 Sure, it doesn’t rely on balls of glitter and disco lights to make it look fancy, but it does have exactly what you need to be comfortable in the bush, with options to upgrade and add accessories if you feel the need. As a family tourer, it really is a serious contender in the camper trailer scene. 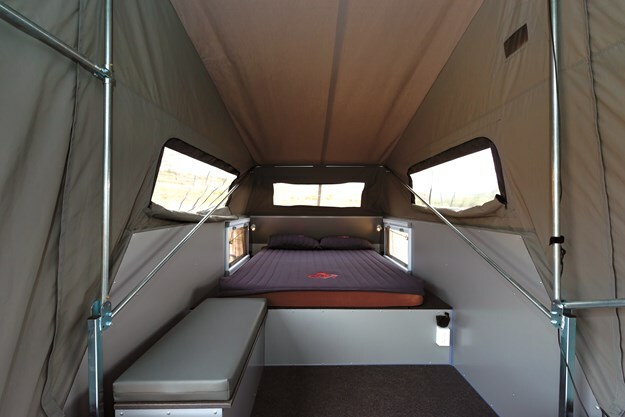 If you’re after a spacious Aussie-made hard floor camper, you’d be crazy not to check it out.